If you are familiar with a KitchenAid Mixer, one of the best in the business, they took that same basic concept and used the same 220 watt motor to make a stand-alone burr grinder for coffee beans. Now granted, this is not an inexpensive coffee grinder and it is targeted towards those of us who are coffee connoisseurs, which includes espressos, lattes, French press, and every other type of coffee bean related drink. However, this KitchenAid Burr Coffee Grinder review should help you figure out if it is worth it to you. Although there are many types of coffee grinders on the market and many of them are far less expensive than this one is, the flat plate burr grinder that the KitchenAid uses is far better for avid coffee drinkers than less expensive blade grinders. Any coffee grinder will do a credible job of grinding beans for your drip or percolator coffee pot, but if you really must have consistent grinds of any type of bean, you’ll be hard pressed to find a better grinder for the money, than the KitchenAid KCGO702 Burr Coffee Grinder, especially if you like French press or pour over coffee. It is a very attractive machine, with a glass mounted bean hopper capable of holding 7 ozs of beans, and a glass grounds container underneath. It comes in 3 different colors, red, black and silver, which will fit into virtually any kitchen decor. It is solid, sturdy and heavy, and on first glance you might actually think it is a KitchenAid mixer. Yes, they look that much alike. The body is made of heavy die-cast metal, no plastic here, so it will be much more durable than a plastic bodied unit. It’s also easy to damp wipe clean the exterior. Both the hopper and lower grounds container are made of glass, which is a nice overall touch. However, glass is still glass, and that means if it is banged too hard, dropped or abused in any way, it is going to shatter and break. All that means is you’ll have to use a little extra care here. Also, the hopper glass is slightly thicker than the grounds container, which means you’ll need to take extra care with the container. It stands 10 inches tall without the attached hopper, 9.8 inches long and 5.9 inches wide. The unit weighs about 10 pounds, so it isn’t going to move much once it is in place and grinding. The power cord is about 18 inches long, so you’ll need to be fairly close to an outlet to use. The KitchenAid burr grinder is designed to give you 15 different grinds, with 8 actual grind numbers and 1/2-clicks between them. You’ll be able to go from very coarse, like French Press coarse, to almost a fine powder, like Turkish coffee consistency. French Press consistency is particularly wonderful with this grinder. The finest setting right out of the box may seem not fine enough, but you only need to do an easy one time manual adjustment to make it grind even finer for espresso or Turkish. Both the hopper and the grounds container screw on to their respective ports. Although this makes for a good and tight seal, care must be taken to keep grounds out of the threads or the hopper/grounds container may jam when screwing them on. Because the lower container is made of glass, there is very little static cling, so the grounds won’t fly out and mess up your kitchen counter when you unscrew it from the base. You can use dark and oily roast beans and can be sure that the unit won’t clog up or bog down over time. Even so, you must clean the parts with the provided brush regularly. As stated before, the KitchenAid uses a flat plate burr grinder, as opposed to a conical burr grinder or a blade grinder. Blade grinders spin very fast and have a tendency to burn the beans, thereby altering the taste when grinding. Conical burr grinders run at a very slow speed to ensure no heat is created. That makes them the best type of grinders for the finest grinds, much like those used in espresso coffee makers. Flat plate burr grinders spin at a medium-low speed (450 rpm in this Kitchenaid case), so they won’t burn the beans, and although they will give a good account of themselves with all types of grinds, they excel at coarse and medium grinds for French Press and drip coffees. Heat is the enemy of all coffee beans, so realistically, for best results, grind up smaller batches at a time. Better still, grind up just the amount of coffee beans that you need for that particular brew. The grounds container is constructed in such a way that, if you use a paper or conical permanent filter, you can leave the container unscrewed and place your filter inside. In that way, you can ground your beans directly into the filter itself, and you’ll never have to worry about dealing with messy grounds. If you use this machine for espresso grinding, first make a manual adjustment to get it to a finer setting. This grinder is big, bold and will stay put wherever it is set into place. If you have a permanent place on your counter, you’ll never have to move it again. The glass grounds container limits static cling when pouring out the grounds. 15 total grind settings should be more than enough for virtually any cup of joe. You’ll be able to find a color that fits. The stainless steel cutting burrs are easy to access for cleaning and never tarnish. You can use even the darkest and oiliest beans possible and the unit won’t clog up. Fill the hopper for several days of grinding without refilling. It comes with a 1 year hassle free warranty, but an optional longer 3 year warranty may be purchased if you get this at a department store. This grinder isn’t very portable, so if you are looking for a grinder that can be stored away every day, this may not be your best choice. The actual running gears that turn the grinder are made of plastic. They have been known to shear under heavy continuous use. If you are more into Espresso coffee you’ll probably find more suitable choices out there, as you will see that right out of the box, the finest setting on this unit is not fine enough for it. But for French Press coffee or pour over, this machine is a good buy. The glass containers are not the best ideas if you have kids or if you’re not very careful handling them. 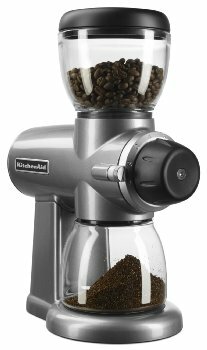 The reality is that this KitchenAid Burr Coffee Grinder is a very decent grinder that will look elegant on most any counter. Granted, it shines and grinds best on finer grounds, but make no mistake, there are grinders at twice the price that aren’t this good. So, for an all around superior coffee grinder, with a pedigree like KitchenAid, you’d be hard pressed to do better, for both ease of use and performance, at any price.